This section contains instructions for manually setting up Internet Information Services (IIS) 7.0 and later to work with PHP on Microsoft Windows Vista SP1, Windows 7, Windows Server 2008 and Windows Server 2008 R2. For instructions on setting up IIS 5.1 and IIS 6.0 on Windows XP and Windows Server 2003 refer to Microsoft IIS 5.1 and IIS 6.0. FastCGI module is disabled in default installation of IIS. The steps to enable it differ based on the version of Windows being used. Click OK and wait until the installation is complete. Click "Next" and then "Install" and wait for the installation to complete. Non-thread-safe build of PHP is recommended when using IIS. The non-thread-safe builds are available at » PHP for Windows: Binaries and Sources Releases. 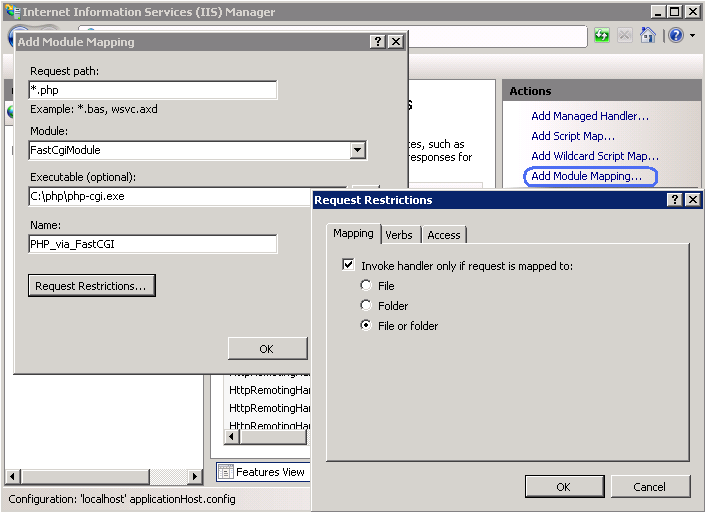 Configure IIS handler mapping for PHP by using either IIS Manager user interface or a command line tool. Click OK on all the dialogs to save the configuration. Use the command shown below to create an IIS FastCGI process pool which will use php-cgi.exe executable for processing PHP requests. Replace the value of the fullPath parameter with the absolute file path to the php-cgi.exe file. 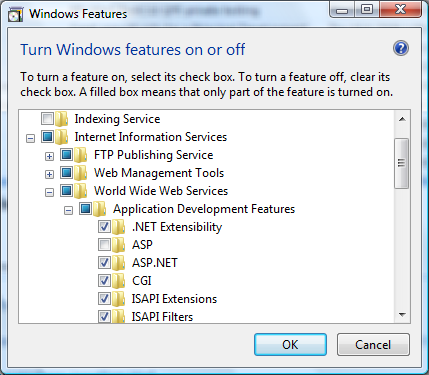 Configure IIS to handle PHP specific requests by running the command shown below. Replace the value of the scriptProcessor parameter with the absolute file path to the php-cgi.exe file. This command creates an IIS handler mapping for *.php file extension, which will result in all URLs that end with .php being handled by FastCGI module. At this point the required installation and configuration steps are completed. The remaining instructions below are optional but highly recommended for achieving optimal functionality and performance of PHP on IIS. It is recommended to enable FastCGI impersonation in PHP when using IIS. This is controlled by the fastcgi.impersonate directive in php.ini file. When impersonation is enabled, PHP will perform all the file system operations on behalf of the user account that has been determined by IIS authentication. This ensures that even if the same PHP process is shared across different IIS web sites, the PHP scripts in those web sites will not be able to access each other's files as long as different user accounts are used for IIS authentication on each web site. For example IIS 7, in its default configuration, has anonymous authentication enabled with built-in user account IUSR used as a default identity. This means that in order for IIS to execute PHP scripts, it is necessary to grant IUSR account read permission on those scripts. If PHP applications need to perform write operations on certain files or write files into some folders then IUSR account should have write permission to those. To determine what user account is used as an anonymous identity in IIS 7 use the following command. Replace the "Default Web Site" with the name of IIS web site that you use. In the output XML configuration element look for the userName attribute. If userName attribute is not present in the anonymousAuthentication element, or is set to an empty string, then it means that the application pool identity is used as an anonymous identity for that web site. To modify the permissions settings on files and folders, use the Windows Explorer user interface or icacls command. 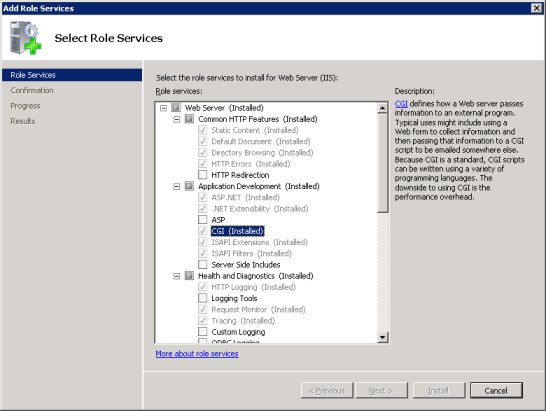 Configure IIS FastCGI settings for recycling of PHP processes by using the commands shown below. The FastCGI setting instanceMaxRequests controls how many requests will be processed by a single php-cgi.exe process before IIS shuts it down. The PHP environment variable PHP_FCGI_MAX_REQUESTS controls how many requests a single php-cgi.exe process will handle before it recycles itself. Make sure that the value specified for FastCGI InstanceMaxRequests setting is less than or equal to the value specified for PHP_FCGI_MAX_REQUESTS. Increase the timeout settings for FastCGI if it is expected to have long running PHP scripts. The two settings that control timeouts are activityTimeout and requestTimeout. Use the commands below to change the timeout settings. Make sure to replace the value in the fullPath parameter to contain the absolute path to the php-cgi.exe file. PHP searches for php.ini file in several locations and it is possible to change the default locations of php.ini file by using PHPRC environment variable. To instruct PHP to load the configuration file from a custom location run the command shown below. The absolute path to the directory with php.ini file should be specified as a value of PHPRC environment variable.